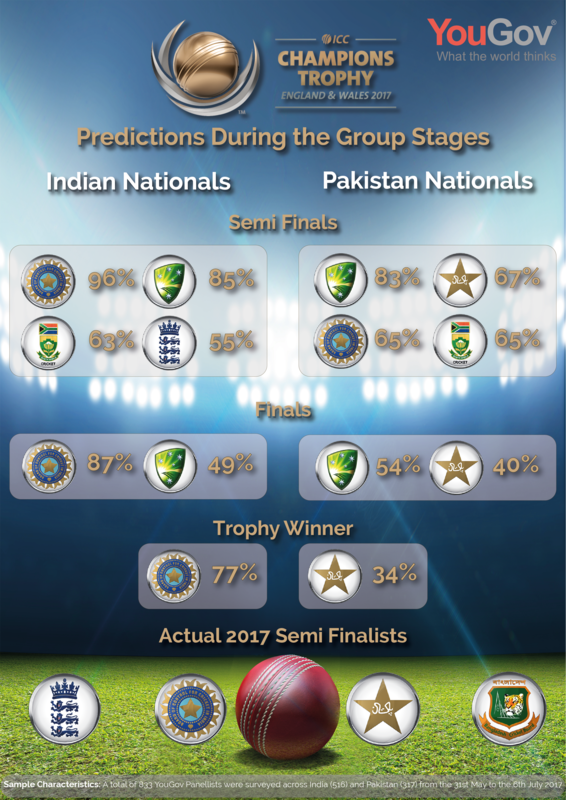 YouGov | ICC Champions Trophy 2017 – Who will make it to the finals? on June 14, 2017, 12:48 p.m. The semi-finals of the ICC Champions Trophy 2017 are due to kick off on Wednesday. With the top four so heavily stacked with teams from the sub-continent, YouGov asked 833 residents of India and Pakistan who they thought would win the series. While the relevance of the Champions Trophy is often questioned in this age of T20 cricket, the YouGov survey indicates a high level of interest with 82% of respondents following the tournament, including 79% of female respondents. With fickle English weather playing no small part in the proceedings, the tournament has already caused a few upsets with the exit of pre-tournament favourites Australia and South Africa, who 84% and 64% of respondents respectively favoured to make it to the top 4. Bangladesh is the clear underdog, with only 8% of either Indians or Pakistanis having picked it to make the semi-finals. Indian residents picked India (96%), Australia (85%), South Africa (63%) and England (55%) as the top four. Pakistan residents believed the top four positions would be Australia (83%), Pakistan (67%), India (65%) and South Africa (65%). With the top four teams now consisting of England, India, Pakistan and Bangladesh it is a mixed result from what was being predicted. At the start of the series both Indian and Pakistani respondents predicted a final between their own team and Australia. While 77% of Indians think that India will win the series overall, only 1 in 3 Pakistanis believe that Pakistan will win the Trophy in 2017. Survey conducted amongst 833 YouGov panellists across India (516) and Pakistan (317) from the 31st May to the 6th June 2017, using YouGov’s Omnibus Express Service. Data is broadly representative of the online adult population in the India and Pakistan.